Who couldn’t love Roscoe? This kid tries to be helpful, but it usually gets him in the time-out chair. Katherine Applegate’s little boy humor is brilliant. 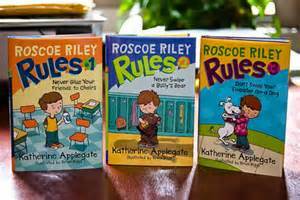 I love how Roscoe starts out every book in time-out. “What on earth did he do now?” It’s Junie B. Jones for boys. Like Junie, the things he does make complete sense to him but cause him to get into trouble every time. Perfect for K-2nd (maybe 3rd) grade. The short paragraphs and illustrations make it extra enjoyable for early reading.